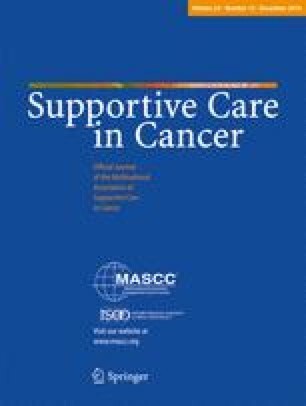 In 2010, St. James Institute of Oncology (Leeds, UK) created a new acute oncology service (AOS) consisting of a new admissions unit with a nurse-led telephone triage (TT) system. This audit cycle (March 2011 and June 2013) evaluated patient experiences of the reconfigured AOS and staff use of the TT system. Patient views were elicited via a questionnaire and semi-structured interviews. The TT forms were analysed descriptively evaluating completion and data quality, reported symptoms and their severity and advice given (including admission rates). Patients (n = 40) reported high satisfaction with the new AOS. However, 56 % of patients delayed 2 days or more before contacting the unit. In 2011, 26 % of all the admitted patients were triaged via the TT system; 133 TT forms were completed. In June 2013, 49 % of the admitted patients were triaged; 264 forms were completed. The most commonly reported symptoms on the TT forms were pain, pyrexia/rigors/infection, diarrhoea, vomiting and dyspnoea. Half of the patients using the TT system were admitted (52 % in 2011, 49 % in 2013). Our audit provided evidence of successful implementation of the TT system with the number of TT forms doubling from 2011 to 2013. The new AOS was endorsed by patients, with the majority satisfied with the care they received. The online version of this article (doi: 10.1007/s00520-016-3370-4) contains supplementary material, which is available to authorized users. The authors would like to thank Dr. Geoff Hall, Dr. Alison Young and all AOS staff for their cooperation and support. This work was carried out as part of the eRAPID Development Grant RP-DG-1209-10031; ISCTRN trial number CCT-NAPN-21338, funded by the National Institute for Health Research (NIHR).